Spring may be here, but the chilly days still feel like soup and stew weather to me. To provide balance between seasonal freshness and comfort, this lamb and butternut squash stew is seasoned with AIP-friendly warming spices and topped with a bit of fresh arugula for both color and flavor. For the second year in a row I was fortunate to be among the few lucky folks this spring to get one of the lambs raised at Polyface Farm by Joel Salatin’s young grandson. It gives me great joy to know that I am supporting the efforts of another generation of farmers devoted to providing the public with meat raised in such a way that is healthful and heals the land. I strongly encourage all of my clients, particularly those with inflammatory bowel diseases like ulcerative colitis and Crohn’s disease, to include lamb as one of the proteins they eat on a regular basis. Most rely upon chicken to make up too large a portion of their diet, which is problematic for a number of reasons, including that it it is likely to result in a diet that is too high in omega 6 fatty acids and too low in omega 3s. We’ve been told that red meat is unhealthy, but if it is from exclusively grass fed animals (which most lamb is), it contains significantly higher amounts of omega 3 fatty acids and conjugated linoleic acid that has been shown to be anti-inflammatory. Lamb is a particularly high quality protein, and is a good source of iron, zinc, selenium and vitamin B12 – all of which are critical for gut healing. What if I can’t get lamb “stew meat”? If you can’t find cubed lamb stew meat, you can use a lamb shoulder. If lamb isn’t available at all, goat meat or grass fed beef would also work nicely in this recipe. I like to make my own bone broth, but if you prefer to purchase it, there are some good options now. Check out this post I wrote for some of the ones that are available broadly. When you go on AIP and have to eliminate so many spices, it can feel like nothing is left, but that is hardly true! Ginger, cinnamon, and saffron are all compliant and add a ton of flavor. Just make sure the spices you use come from a gluten-free factory, such as this brand. Looking for a single place to get all of your AIP-compliant ingredients and foods? ShopAIP has got you covered! Make sure you check out the special sales… at the time I published this post they were getting ready to move to a new facility and have all the “heaviest” items on sale in order to lighten the load of the moving truck. It’s a win-win! 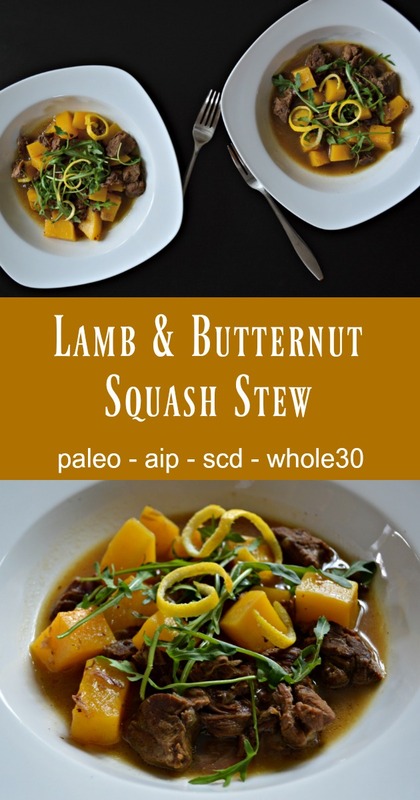 This recipe is compliant with both the Paleo autoimmune protocol (AIP) and the Specific Carbohydrate Diet (SCD) as written. To make it low-FODMAP, simply omit the onion and the garlic. 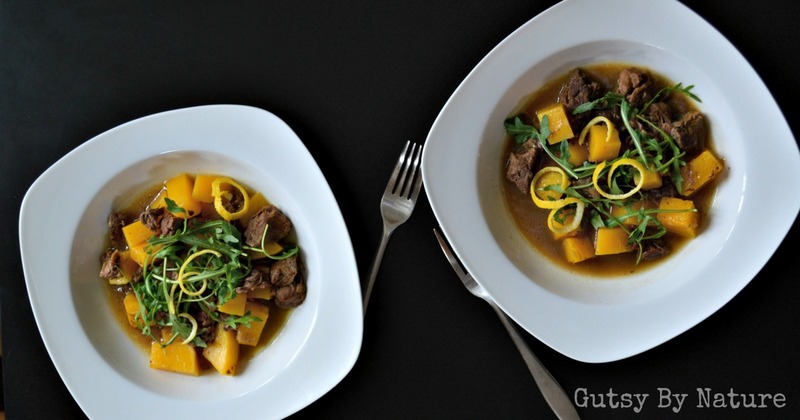 The warming spices of this AIP-compliant lamb and butternut squash stew combined with the freshness and bite of a topping of arugula give flavor and complexity to an otherwise simple and humble dish. Combine ginger, cinnamon, garlic, saffron, salt and olive oil. Coat lamb stew meat evenly with mixture and allow to marinate in refrigerator for 2-24 hours. In Dutch oven or other large post with lid, brown lamb meat over medium heat for about 5 minutes, stirring to insure all sides are browned. Add onion and cook until softened, about 3 minutes. Add bone broth and apple cider vinegar and increase heat to high until it comes to a boil. Reduce to simmer, cover on low simmer for 2½ hours. Prepare squash by peeling, deseeding, and cutting into cubes. Add squash cubes and cover again. Cook for 20 minutes, or just until squash is soft. Divide into 3-4 serving bowls and top with lemon zest and arugula for serving. Your recipe sounds delicious and right up my alley, love lamb. What flavor bone broth did you use? Your recipe sounds and looks delicious and right up my alley. I was wondering what kind of bone broth you used? Great question Marlene! I usually make my bone broth with whatever bones I have on hand instead of sticking to a particular flavor. But if you are buying broth, I think that chicken would probably taste the best in this recipe. Beef might be a bit too overpowering for the delicate lamb flavor. Hi there, this sounds really wonderful and after having read how lamb is a good protein to add to your diet, I have been looking for more recipes that include it. I definitely would like to try this recipe, but I was wondering if you thought this would work in a slow cooker. And how would you alter to use in a slow cooker if you think it would work.